Take the first step toward real and lasting communication effectiveness at your organization. 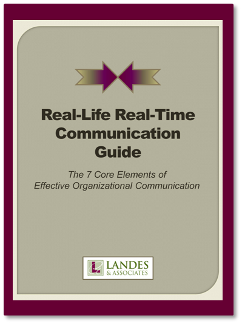 Complete the brief form at the right of this page to download your copy of the free 20-page Real-Life Real Time Communication Guide now. It will provide solid advice on how to bring about real, two-way communication within your company. It will also introduce you to a communication system that can keep employees tuned in and connected with the goals, priorities and strategies of your organization. Discover how real-life, real-time communication can propel your company’s performance and results! What's your organization's greatest communication challenge?